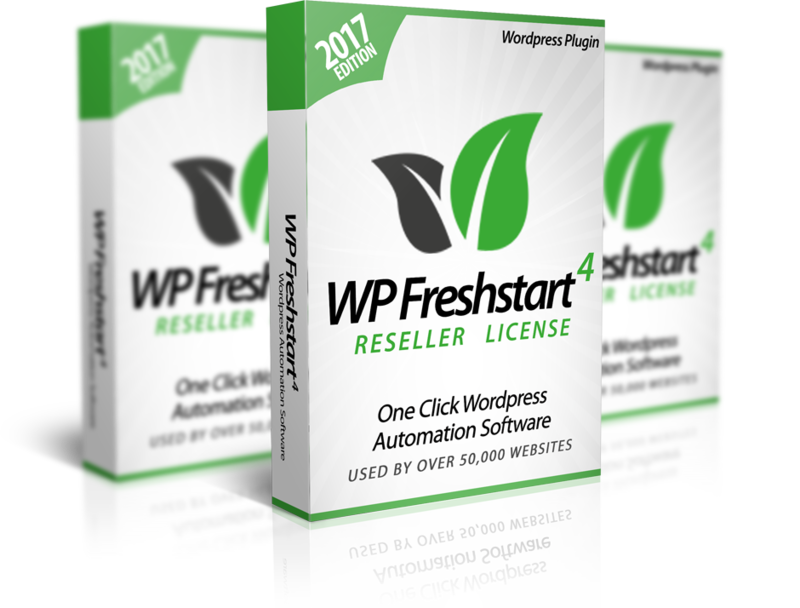 We've decided to LET YOU SELL WP Freshstart and keep 100% profits to yourself. Which means you will keep 100% of the price of this plugin when you refer them to our website. Our super effective Sales Copy to make all your sales. YES - You don't have to do anything, just collect your 100% profit and find a way to spend it. EVERY WORDPRESS USER WANTS for their site. So jump on this offer before we take it down. Important : This is available for our CUSTOMERS ONLY – no one outside our family can become a reseller or even get in here. And we’re allowing a VERY LIMITED number of people to get in on this because we want to keep this super exclusive. We have worked very hard on this software and this is your chance to make a LOT of money while we do all the work. Listen - This could be your only chance to become a reseller so click the button below and GET IN, be part of the exclusive group of people who can resell our excellent product and make unlimited profit for yourself. Video pages SELL, thats one thing about them that is for certain. This plugin lets you create video pages for product sales, affiliate promotions, reviews and almost anything you want. You can create new video pages in under 2 mins without any coding knowledge. Create Pinterest Style review pages and posts for your blog. Pinterest is one of the hottest sites on the internet and because of their design, it gets a lot of visitors all across the site. Use this on your own site by using this plugin. Create pages on your site can can go viral in just a few minutes. Viral pages helps you create compelling pages to drive social media traffic and sell any kind of offer on that page, be it your own offer or an affiliate offer. Viral traffic is free traffic and its the best kind so use this to your advantage. PLUS all the Premium Bonuses listed above. HURRY : Price goes up by $100 very soon! You'll never get this chance again.